HomeFeatured2017 SDCC coverage/ Ashley Woods named as Tomb Raider series artist! 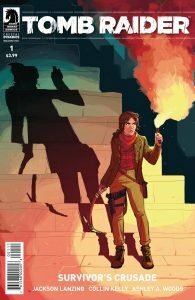 2017 SDCC coverage/ Ashley Woods named as Tomb Raider series artist! Ashley A. Woods (creator of Millenia War, artist on Niobe: She is Life, artist on Ladycastle) has been named as the artist on the upcoming comic book series Tomb Raider: Survivor’s Crusade. “The trials and tribulations of Lara Croft continue! Dark Horse and Crystal Dynamics are excited to announce the next installment in the Tomb Raider comic universe. Tomb Raider: Survivor’s Crusade boasts a whole new creative team with Jackson Lanzing and Collin Kelly (Joyride, Hacktivist) composing Lara’s new adventure, while Ashley A. Woods (Ladycastle, Niobe) brings Lara Croft to life, and colorist legend Michael Atiyeh (Conan the Slayer, Predator vs. Judge Dredd vs. Aliens) makes the art pop! Hannah Fisher (Cosmoknights) has created the gorgeous cover for the first issue. In Tomb Raider: Survivor’s Crusade, Lara Croft has unfinished business. After facing Trinity in Siberia, she’s driven to unravel the mystery behind her father’s death. After pushing her training to the limit and following clues that lead to more questions than answers, Lara is prepared to put everything on the line to uncover the truth. Tomb Raider: Survivor’s Crusade’s”.